Most instances of remote and even synchronous learning involve basic content delivery. Students can’t make it to class or campus, so they do the next best thing. They watch recorded lectures, make their way through learning modules, and occasionally videoconference or message their instructor and peers. But that’s not how Dr. Gregg Cannady sees it. Cannady teaches at the Highlands Ranch STEM School, a public charter school in the suburbs of Denver. Over the past few years, Cannady has pursued a singular goal: connecting his students with as many industry leaders, experts, educators, and other classrooms as possible. Highlands Ranch learners do this all from their own campus. 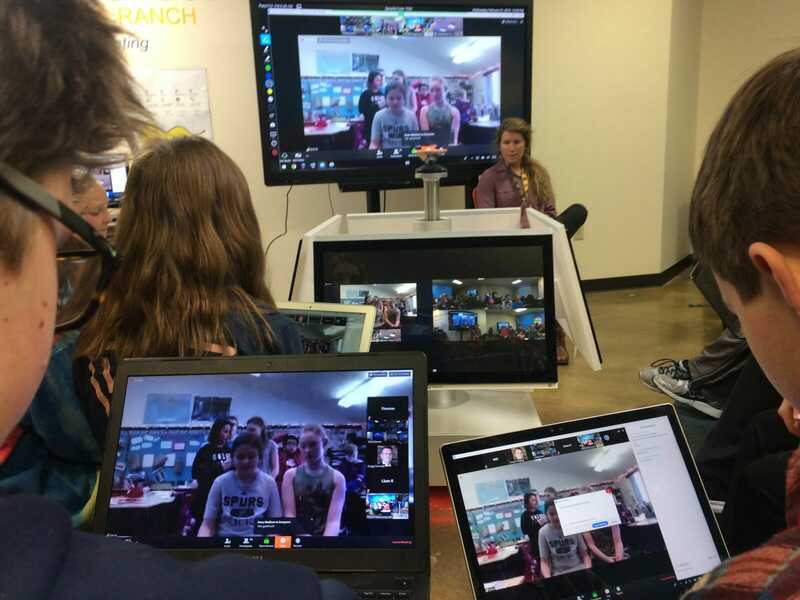 With the use of videoconferencing software and devices, Cannady has become something of a synchronous learning evangelist. “Synchronous learning technology allows for engaged learning where students solve problems in real time with other students, [people in other] industries, higher ed, and anyone else,” Cannady said. The synchronous learning classroom at Highlands Ranch, known as the SYNK, consists of a smartboard, numerous monitors, a projector, a 360° degree camera and video display from Polycom, audio equipment, and mics that can pick up speech from anyone in the room. For software, Cannady uses Zoom videoconferencing along with the Pano app from Polycom. Yes, that’s a lot of hardware. Highlands Ranch has benefited from some generous donations in that regard. But at the same time, Cannady stresses that he’s doing his best to explore the potential of technology currently available. Many other schools participate in synchronous learning with Highlands Ranch students and make do with significantly less. One fruitful connection allowed by the SYNK has been the connection between rural and urban classes. Cannady has facilitated collaborative learning between his classes and those in Arickaree, CO, a rural district where he grew up. Cannady likes to emphasize that partnerships with innovative companies and the tech industry should be a key component of any K-12 education. But at the same time, that partnership needs to occur with good faith on both sides. Videoconferencing software allows for full participation of every learner. As a final thought Cannady highlights how the education system is largely broken in the U.S. and one of its biggest problems is that doesn’t sufficiently support teachers.